In Italy, a wave of tactical televisions is rising connected to no-war mobs and new global movement. After video activism and net activism we can consider this a new kind of tv activism for the number of people, energies, ideas involved. 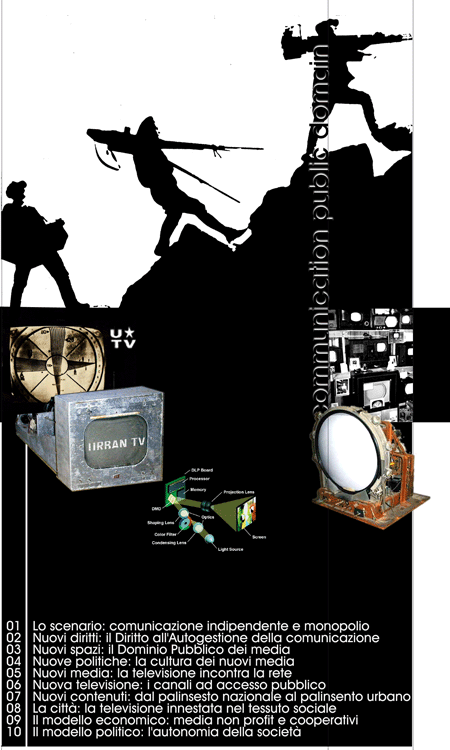 Urban TV is a project for an open access television in Bologna and in other Italian cities, filling the level between the street (like Telestreet) and the satellite channels (like No War TV). If you like an attempt to bring the here-unknown Open Channel format. It tries to face some issues not resolved yet in other projects. For these reasons it started a development website and write down a manifesto, by Matteo Pasquinelli. The Manifesto of Urban Televisions, explains Pasquinelli, reflects the current Italian debate on media, hybridising it with Dutch blends like Public Domain 2.0 and with some tools from French-Italian postfordist criticism. "The culture of independent communication in any form, from video activism to free radios to Free Software, has opened a new space among common media and technologies, a space whose political and cultural citizenship must now be recognized. The cultural, political and legal frame of this movement is a space that we call Public Domain of communication. As a Public Domain we understand a sphere which does not belong neither to the State nor to the Market, but to the whole society, and it is managed and controlled by the society itself (not to be misunderstood with the public service performed by the State). The new autonomous public domain of communication must be recognized by institutions as means of participative democracy and new municipalism." >from *Manifesto of Urban Televisions*. For a participative democracy of mass media (and the realisation of the first italian open access television). April 2003.